Raised in the Jungle buy a tribe of natives and sentient tigers, Tigerboy is the recipient of a a amgic amulet and armor that gives him superhuman tiger-based powers. The armor used to be a whole, intricate suit of armor made from mystic materials, but after centuries and misuse by a previous recipient, the armor is only in pieces. The only piece he is able to wear, as he is a boy, is a small section that fits on his arm (again, a one-armed armor motif that we both seem to appreciate). 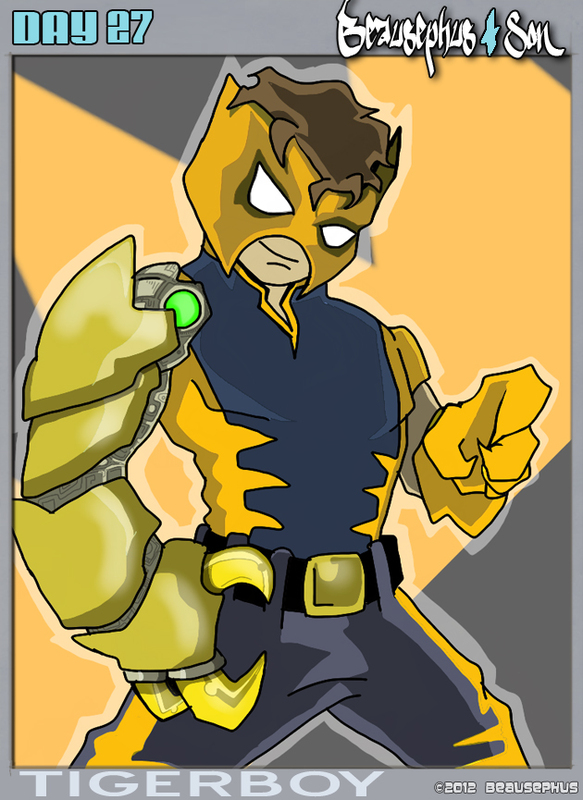 Tigerboy is learning to use his powers and as he grows so to will his abilities and his ability to wear more armor. Tigerboy fights evil in the jungles and offshoots tribes and monsters who are trying to destroy the talking tigers and the clan of magicians determined to protect them and the jungle itself.